Kids are constantly learning new concepts in reading, writing, and math every day at school. As they get older the concepts change and become more difficult. The great part about social/emotional learning is that we can use the same curriculum with the same language from kindergarten on. 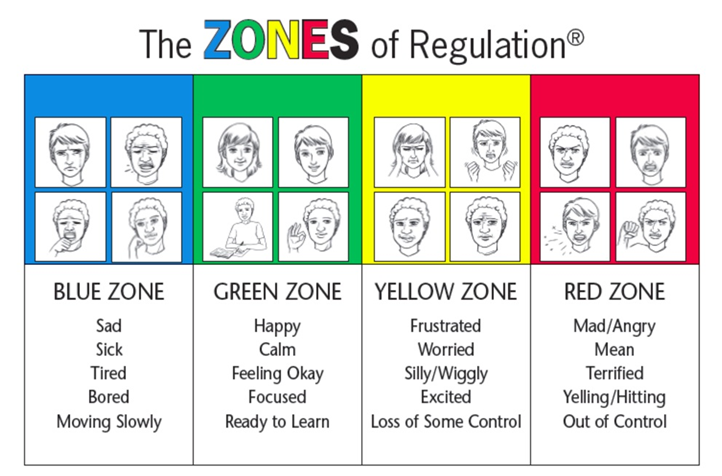 The ZONES of Regulation is a curriculum we teach at Tashua School. Kids are learning to identify what Zones they are in based on their feelings. Each Zone has a set of triggers (things/events that make you experience those feelings) and coping tools (strategies to help get you back to Green Zone (which is where you aim to be). We have been lucky enough to teach this curriculum in individual sessions, small group (lunch bunch), and the general education setting for classroom lessons. It has been proven that children benefit from learning social/emotional skills such as identification of feelings and coping tools to help them improve their academic learning and social skills/peer relationships.